Harbour City’s annual outdoor Christmas lighting display is one of Hong Kong’s must-see attractions. 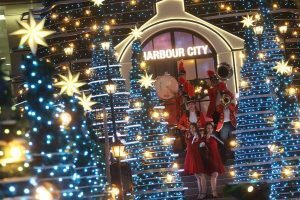 The theme of this year is called “Christmas Treasures” and turning Harbour City into a “treasure city” with a series of festive photo spots and activities, aiming to let visitors create a memorable Christmas. The highlight of this year is launching the world’s largest video kaleidoscope. 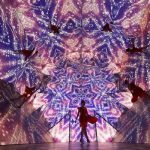 Visitors can walk through the 16 meters long, 4.5 meters high and 4.5 meters wide kaleidoscope, viewing dynamic Christmas themed scenery such as snowflakes, Christmas tree, stars and rainbow tunnel which are refracted through the triangular mirror and LED screen walls. Simply make donation to “The Hong Kong Blood Cancer Foundation”, you can visit this “selfie” and video friendly photo spot. Besides, you can find the largest-ever 60 feet high Christmas Tree and 40-meter-long Christmas Love Lock Bridge” in the Ocean terminal forecourt. Customers can choose their favorite color of Love Lock (without key) representing different wishes and lock it on the bridge fence to make a wish upon HK$20 donation. A festive special Post Office “Xmas Post” & “Santa Studio” are also opened under the Bridge with a large post box and plenty of unique postcards around the Christmas scenes. Nearly 200,000 LED lights cover the entire Christmas Bridge, giant Christmas tree and other festive installations to create different spectacular lighting effects. More than that, original music arrangement has been composed for the light show to match with the different colors of romantic scenery. This multimedia show has set the harbour ablaze and will showcase the vibrancy and glamorous night vista of Harbour City. Harbour City has also invited the England designer duo, Miller Goodman to create a joyful and playful decoration inspired by the classic story, “The Nutcracker”. It transforms the mall’s atrium into interactive story settings and makes you feel like part of the storytelling.